The Trust has a robust approach to the implementation of the Mental Capacity Act 2005 and the associated Deprivation of Liberties Safeguards. 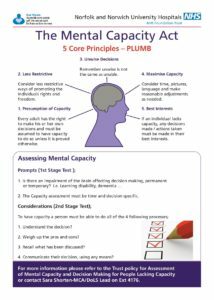 The Mental Capacity Act (MCA) is designed to protect and empower individuals aged 16 and over and help to safeguard the human rights of people who lack (or may lack) mental capacity to make decisions about their care and treatment This includes decisions about whether or not to consent to care or treatment. This may be because of a lifelong learning disability or a more recent short-term or long-term impairment resulting from injury or illness. The MCA also allows people to express their preferences for care and treatment in case they lack capacity to make these decisions. It also allows them to appoint a trusted person to make a decision on their behalf should they lack capacity in the future. People should also be provided with an independent advocate who will support them to make decisions in certain situations, such as serious treatment or where the individual might have significant restrictions placed on their freedom and rights in their best interests. https://www.gov.uk/government/collections/lasting-power-of-attorney-forms Department of Justice, Lasting Power of Attorney forms and guidance. Deprivation of Liberty Safeguards are a part of the MCA and relate to people who are placed in care homes or hospitals for their care or treatment and who lack mental capacity. You can find out more about MCA on the NHS website .